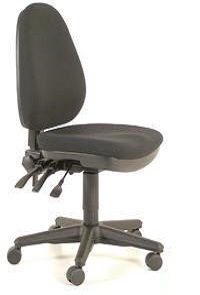 The Verve High Back provides superior comfort with a generous seat size and support for the upper and lower back. Indicative maximum user weight 140kg. 60mm twin wheel easy-glide castors. High density polyurethane moulded foam seat. Tilting seat that can be locked in any position or free floating.